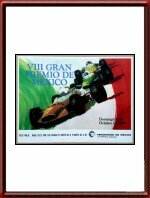 Vintage Original poster for the Mexican Grand Prix held on October 19, 1969. A VERY rare poster indeed! The artwork shows an artist's impression of what looks to be a McLaren ahead of a Lotus F1 car against a backdrop of the Mexican national colors, Green, White and Red. 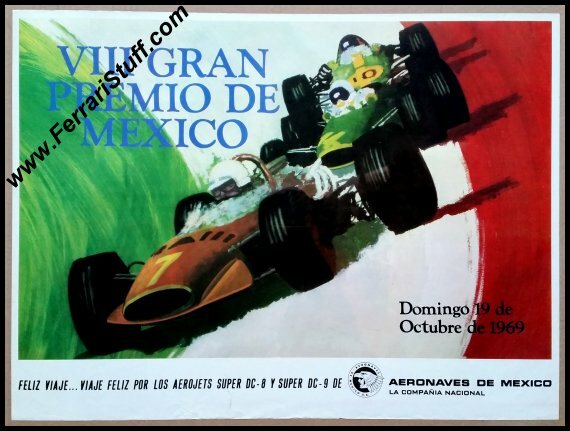 The bottom edges show a nice advertisement for Aeronaves de Mexico, Mexico's national airline, that encourages you to travel with them on their Super DC-8's and DC-9's. The race was won by Denny Hulme on McLaren, ahead of Jackie Ickx on Brabham and Jack Brabham on... Brabham! Pedro Rodriguez drove a NART-entered Ferrari 312/69 to a 7th place. The poster measures some 23 x 17 inches or 59 x 44.5 cm.